With the increasing importance given to LED lighting not only in US and Europe but recently more so in Japan, South Korea, a sales of more than 1 Billion LED lamps (shippment of the complete lighting unit) is expected in year 2014, which can be estimated to result in a revenue growth in the range of 30-40% in 2014, and in 2016 it can be estimated to reach 3 Billion unit shippment of LED lamps. The total revenue generated by LED lamps in 2014 can be estimated in the range of 6-8 Billion US$. If we look at LED chips (single unit LED on a die without driver electronics) shipment, it is easily 4 to 6 times the LED lamp shipment. Examples of LED lamps include spotlights, bulbs, LED-luminaries, streetlights and tube lights. If this is about LED revenue figures for lighting applications alone. The complete high brightness LED market is expected to grow at a slightly lower level of 20% in 2014 and the total high brightness LED sales in 2014 (including lighting, LCD backlighting, indusrial, and others) can be estimated around 25 Bilion US$. This excludes LEDs used in front panels of electronics systems and devices used for signal indication. LED market in 2014 and 2015 is anticipted to be a close repeat of solar PV market in 2012 and 2013, where China could supply low cost products to the developed regions and may get the tag of 'dumping'. Below is the further analysis on LED market covering leading players to commodity kind of LED makers. Between 2012 and 2013, LED backlighting in LCD panels gave the launch pad for the growth of LEDs as light source. The backlighting market has now quickly matured, except in large screen size (above 32 Inch) TVs. In general lighting applications, the growth has started in mid 2013, there is lot of optimism that fast growth will continue up to 2018. However some are predicting a temporary dip in year 2015 due to excessive supply, mainly from Chinese manufacturers. There are chances of rollercoaster kind of growth. The cost and technology dependent LED market will also have some other parameters to decide the success of a company. The regional market is one of the important parameter. Government support, region wise restrictions, patent issues, technology innovations, are some of the parameters to affect the LED market. The market is not simple, it is complex. A light emitting diodes with high efficacy close to 150 lumens per watt is now available from many vendors, this is something which is already available in the market. Though some vendors claim close to 300 lumens per watt, that is still in the labs. This particular data is important for streetlights, where LED lights can replace high-pressure sodium vapour lamps and halide lamps. Finally for the end-user, it points out to more lumens of light they can buy per dollar. At present users can expect close to 600-700 lumens per dollar. The cost of 40 Watts incandecent replacement LED bulb is now in the range of 3-4$ (depending on the vendor). In home lighting, 40 Watts replacement LED lamps consuming less than 8 Watts gaining popularity as a replacement for traditional incandescent bulb. The reason for the increasing use of such lamps is falling cost of LED lamps. The top end manufacturers of such lamps include Philips, Samsung, GE, Sharp, Toshiba, and Panasonic. And there are lot of less known makers in this market. In India MoserBaer and Wipro are also making 40 watt LED lamps. 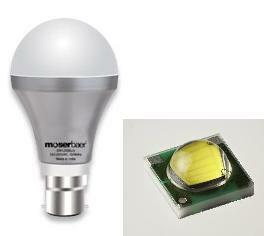 Moser Baer is selling its LED bulbs online at a price starting from Rupees 390/- on its website http://shop.moserbaer.in. Moser Baer LED Bulbs can also be purchased at online stores such as Flipkart and snapdeals. Wipro LED bulbs are shown in Flipkart with a note of "coming soon". The shipment of tube LEDs is forecasted to reach 1 billion by 2018. The important market for LED tube lights are offices, where the tube lights are switched-on for around 15 hours a day. LED Tubes save 50% of power consumption compared to fluorescent tube lights. In automotives, LEDs are preferred for many lighting applications including head lamps. The automotive is expected to be 1 billion US$ market in 2015 for LEDs. The somewhat mature market for LED lamps is backlighting in LCD display panels. Until 2013, this was the biggest market, after 2013 the lighting has overtaken backlight segment. However in the large size television market LEDs are still replacing CCFL. In region wise consumption, Japan leads due to significant rise in use of LEDs for lighting applications. South Korea closely follows Japan in adopting LEDs for lighting. Other important regions includes US, Europe, Taiwan and China. Asian countries such as Malaysia, Thailand and India are also significantly increasing the use of LEDs. There is a clear distinction Between vendor types. There vendors who clearly focus on high brightness LEDs for lighting applications. They are Cree, Osram, Nichia and Philips lumileds. We estimate Nichia's 2014 revene to exceed US$ 3700 Billion in 2014, a growth of 20% y-o-y. Nichia is clearly the toppest leader in LEDs. Lumileds Lighting invested by Philips estimated to generate a revenue of more than 3 Billion US$ and is growing at 30%+. Another top vendor Cree is estimated increase its share by little 1 or 2% in 2014 to a total share of 11%. The total sales revenue of Cree from LED for 2014 can be estimated in the range of 1.8-2.0 Billion US$. Germany based OSRAM also comes under tier1 list of companies. All these high end tier 1 manufacturer offer 40 Watts replacement LED buld (shown below in the picture) at a price in the range of 9-10$, compared to China vendors who offer at $3-4, LED bulbs from Tier1 are proportionally better in light efiicacy and durability performance. These bulbs can work for 50,000 hours without failure. There are huge number of second level players whose market is centred around backlighting, such vendors include Samsung, Everlight, and such South Korean and Taiwanese vendors. The Tier3 vendors are those in China, who makes low-power LEDs for backlighting as well as low cost lighting. The market in Tier1 area is not crowded, and Tier 1 vendors expect to enjoy the market growth for some more years. Since tier2 and tier3 markets are extremely crowded, the smart and capable vendors from these two tiers will enter Tier 1 and that going to result in fierce price competition benefiting the end user with best LED lamps for home use. Chinese companies alltogether control nearly 35% of LED market and the trend of their rising share continuing. This clearly tells China's LED factories are running full capacity. Chinese factories producing large volumes of LEDs at cheaper prices. Some of the companies have a production capacity of 500,000 pieces per month. Veeco, a semiconductor manufacturing equipment provider for production of compound semiconductor based LEDs, flexible OLEDs, solar cells, RF/ wireless IC chips, has reported a revenue of US$90.8 Million in its 1st Quarter 2014 compared to US$73.2 million in its previous quarter, a sequnetial growth of 24%. 75% of its revenues comes from LED and solar. In Taiwan the two leading vendors are Everlight and Epistar. There is not much difference between revenue earnings of these two companies, however Everlight leads. Both these companies are expecting a double-digit growth in 2014 and 15. Taiwan makes maximum number of notebook computers, that is the big market for these two manufacturers in Taiwan. South Korean leading LED manufacturer Samsung uses much of its production for its own products such as televisions notebook computers, tablets and smart phones. Samsung also aggressively marketing high efficacy package LEDs for lighting applications. Though no exact revenue figures available from Samsung, we estimate it on the list of top four, mostly in the third of fourth position, with the revenue growth of around 10 to 20%. Among the Chinese LED lamp supplier, MLS Electronics shines brighter and is the star performer even globally, MLS makes LED Downlight, LED Ceiling, LED Panel Light, LED Candle Light, LED Bulbs and package LEDs. MLS up its production capacity from 3 million a month to 30 million a month. MLS is said to be maintaining high double digit growth rate since it started in 1997. MLS is said to have 10,000 production line workers. But the story of other Chinese LED makers is not that shining, many companies are under performing with high chances of closing down. Chinese Government provides funds for LED manufacturers in buying vapour deposition equipment. However many companies not effectively producing otherwise under-utilizing MOCVD equipments. Irrespective of few companies failure, China LED industry on whole benefitted from Govt support. Even in the lumens/watt rating, Chinese companies such as MLS are fast catching up with the top tier vendors. The story of LED bulbs is going to be much like mobile phones. What leading LED bulb brands such as Philips may adopt is; sourcing packaged LEDs from China. If you look at the some of the disruptive technologies, organic LED is one of that, but when it comes to reliability and efficacy, still it is a long way for organic LED to beat compound semiconductor LEDs. Silicon-based LEDs which are supposed to be low-cost are also seen as another disruptive technology, but experts are saying it will take another five years before it becomes popular. The trend now is all about cheaper manufacturing. In packaged LEDs, chip on-board and flip chip packages are gaining more popular. Chip on-board is more suitable for street lighting and such high-powered lighting. Whereas flip chip finds its use in automotive production kind of use. Another interesting trend is switching on and switching of the LED lamp wirelessly using ZigBee/bluetooth wireless interface even from the mobile phone. This technology called smart lighting or digital intelligent lighting creates another set of opportunities for power semiconductor companies, where LED lamp is integrated with processor and a wireless chip. The street lamps can be programmed to get dimmed in the midnight compared to early part of the night. They also can be programmed to dynamically increase the brightness by seeing the movement of people or vehicles. Mayflower uses smart lighting control node to control and monitor more than 180,000 street lights, bollards and signs in the UK and Ireland. When this writer interacted with leading LED driver maker ST Microelectronics. Sapna Mongia, Technical Marketing Head, IPG Group, STMicroelectronics says "ST's long-term partnerships with the major lighting suppliers combined with our leadership discrete and integrated power devices enable us to offer high efficiency, low-cost, small solutions for all lighting applications. These include industrial, residential, commercial, architectural and street lighting." ST is top ranked vendor in power semiconductor domain. So all this results into a power semiconductor LED driver market of US$5 billion approximately. India LED market: Though late, Government of India has prioritized LED manufacturing. LED made by local vendors are covered under Preferential market access. India ESDM policy covers LED manufacturing. The market in India though small in the range of 150-200 million is expected to grow above 50% every year in next 2-3 years. There are lot of LED Lamp assembling companies in India, who design and make LED lamps but they import basic LED chip elements. De Core Nano-semicondutors Limited is the only LED semiconductor device maker who has LED wafer fab in India. De core is the India’s first commercial compound semiconductor foundry with its facility 20000sqm located in Special Economic Zone (SEZ) of Gujarat state capital city Gandhinagar. De core has the facility to produce GaN/InGaN based high brightness LED chips is volumes and save the India from import burden in coming years. The quality of LED made by De Core is nothing less than any leading Chinese vendor. De Core makes LED chips (bare-die). LED Modules and Lumainaires, which include downlighters, false ceiling, grid light and tubes. What's more interesting is LEDs finding applications in agriculture. Indoor commercial farming installations are being developed using LED lighting for photosynthesis to maximize plant productivity. Finally the solar PV and LED which are much related both in manufacturing and usage are heading to become a perfect couple; one is light to electricity and other is electric to light, a combination is best recipe for saving this earth from global warming.